Growing up, Brooke LaDouceur was disappointed by the lack of activist culture in her Southern California hometown. 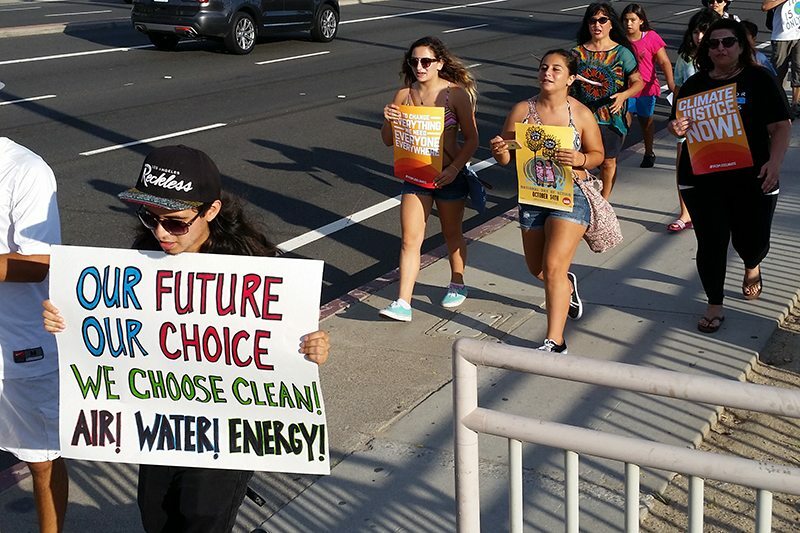 Now, she's a volunteer organizer mobilizing her community for clean energy and climate justice. This is her story. 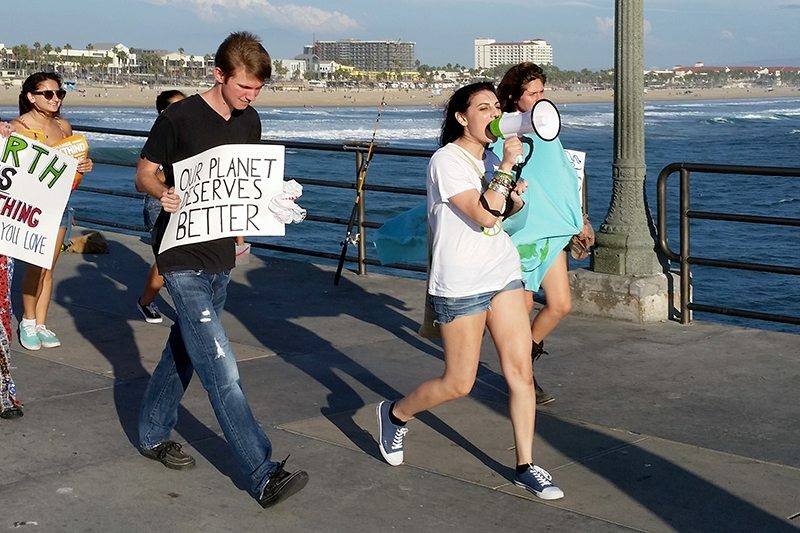 Greenpeace Group Leader Brooke LaDouceur leads a march through Huntington Beach, California as part of the 2015 People's Climate Movement Day of Action. Photo by Mary Martin. The author of this article is a Greenpeace volunteer group leader. To get involved and volunteer with Greenpeace, check out Greenwire. When I was little, I remember telling my parents that I wanted to grow up to be the first woman president. Like many with this dream, I later realized that I had no interest in politics and abandoned the idea. I’ve since come to understand that this dream had nothing to do with politics. It had everything to do with making a difference while surrounded by people I saw as too complacent or apathetic. My dream was rooted in a desire to change the world around me, and the only way I saw to make change was to be in a position of power. 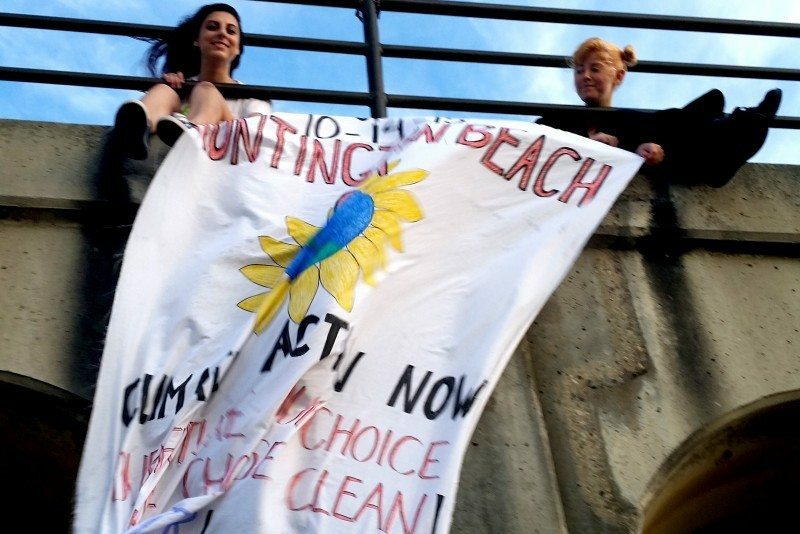 Earlier this year, two Greenpeace canvassers caught me leaving a health food store in Costa Mesa, California. They easily convinced me to make a monthly donation to Greenpeace. Shortly after that, I decided I wanted to more than donate, so I logged in to Greenwire. I found out that Greenpeace was fighting against Shell to protect the Arctic, and activists across the country were going to Shell rallies to raise awareness about the dangers of Arctic drilling. Since I live in the highly populated suburbs of Los Angeles, I was sure there would be a few rallies in my area. I was wrong. My county is somewhat infamous for being predominantly conservative; even for the people here who might be interested in getting involved in activism, the LA traffic makes it inconvenient to travel even ten or 15 miles to organize together. As it turned out, it was rare to find people close enough and dedicated enough to organize with. Bent on taking action anyway, I decided to host my own Shell rally. I made flyers and put them up around my college campus and some coffee shops. I emailed and called local news stations to invite them to the rally. I called the local police station and asked questions about laws regarding protests — on the day of the rally, our group was actually approached by two police officers who came to offer their support and gave us a number to call if anyone bothered us. It was during this planning process that I was invited to apply to be a Greenpeace Group Leader, and saying yes was one of the best decisions I’ve ever made. Now, I organize in my community — that same community that seemed so complacent to me — regularly. Organizing has shown me that politicians are not the only people with the power to change the world, and that is heartening. It’s incredible to know that abandoning my one-time dream of becoming president does not mean abandoning my desire to change the world. 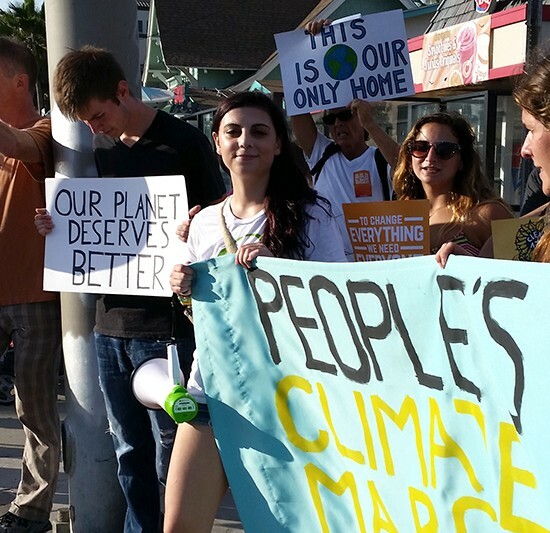 Last month, I participated in the national day of action associated with the People’s Climate Movement. I joined more than 200 people who organized across the country to celebrate the first anniversary of the world’s largest climate action to date. As I marched with my volunteer group through downtown Huntington Beach, passerby were cheering us on and even joining us. Many people cheered and clapped for us, some people just stared and only a few responded negatively. 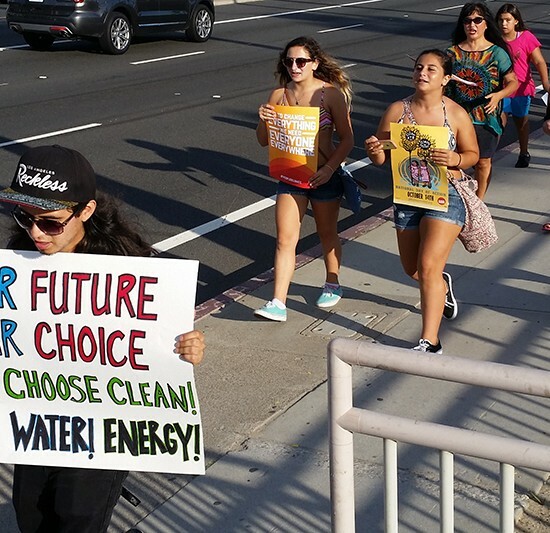 We met cries of “get a job,” with “get a clue!” It was amazing to stand with 25 people from my community to fight against climate change, and it felt just as amazing to stand up to the people who told us to give up. 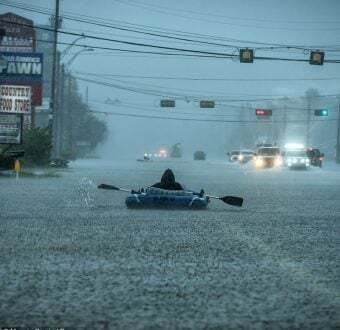 I’d never seen this type of activist spirit before in my hometown. It made me think that maybe there are more potential activists in my area than I realized. After the march, a woman who came with children told me that her “kids and their friends learned a lot. For one: that they can make a difference by raising their voices.” It was an honor to pass a culture of activism on to a younger generation. And maybe that’s the way we can start to make a change, by educating the next generation and preventing them from repeating the mistakes that destroy our environment. Those kids are an excellent example of why grassroots organizing is so valuable and so important — whatever changes I try to make on my own will be amplified by the culture of activism I am starting to build in my community. The march I organized also allowed me to celebrate a spectacular victory for our movement. 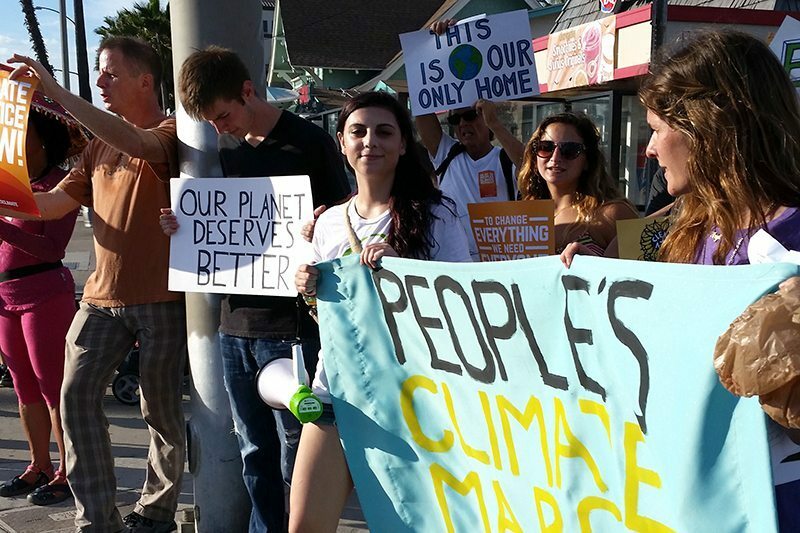 Last year’s People’s Climate March was the largest climate action to date, with 400,000 participants worldwide. That was the largest protest our country has seen since the anti-Vietnam War protests of the 1960s and 70s. For me, it was also the moment I realized that the environmental movement is a growing one that will not be stopped. I realized that I was part of something huge, something that is going to change the world for the better. And last month I had the opportunity to make myself and my community a part of that movement. 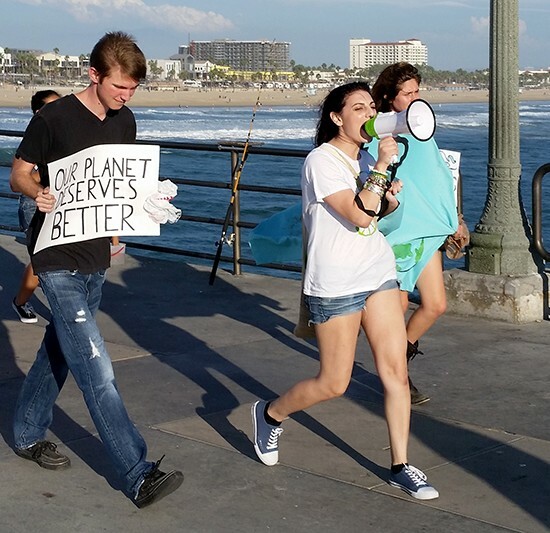 I got to encourage others around me to raise their voices against climate change. 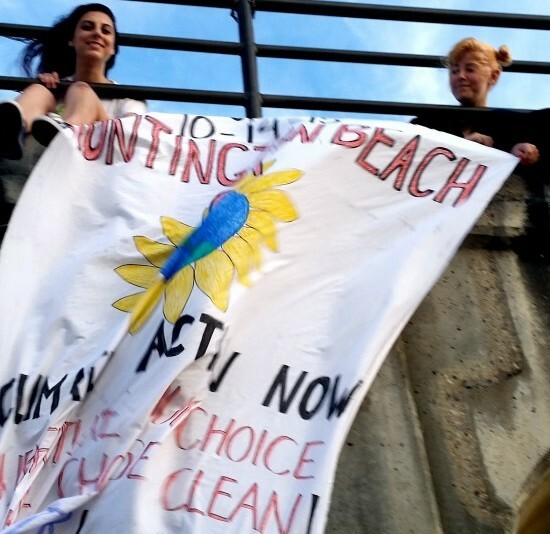 Brooke LaDouceur is a Greenpeace volunteer group leader. You can connect with other environmental activists and volunteers in your area on Greenwire.